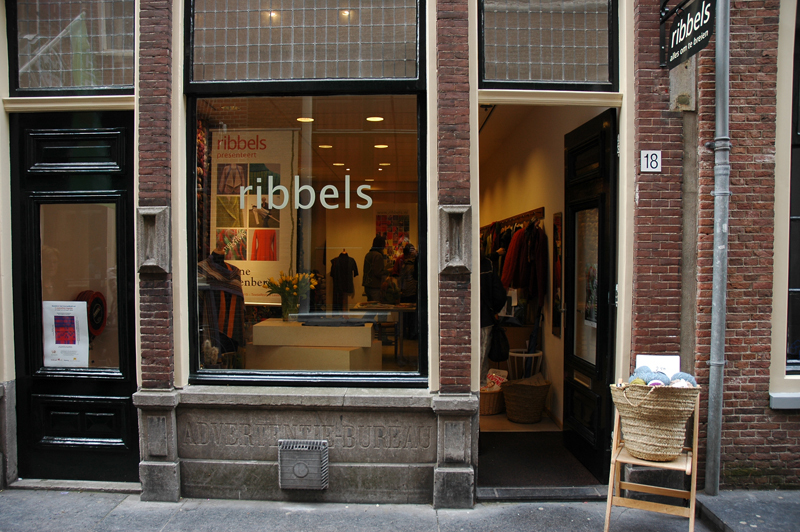 4.The Textile Route of the Textiel Festival is connecting over 40 places where textiles are exhibited in Leiden; here the knitting shop “Ripples”, as one of the stations on the route. 5. 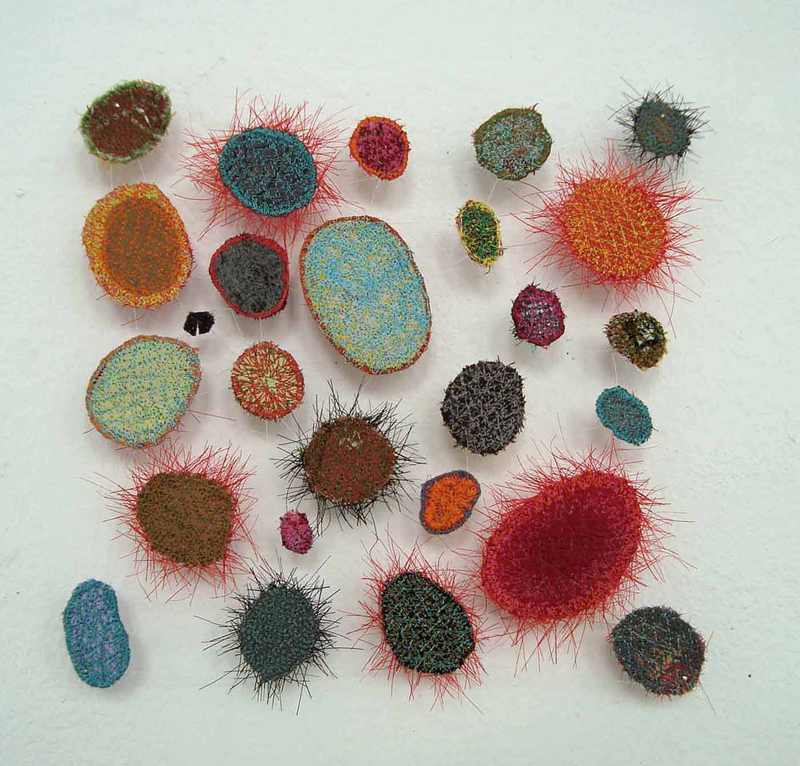 “Colour Dots 9” by Marian Bijlenga, a well-known Dutch textile artist, one of the eight main speakers of the day on Dutch Textile Design and Art. 6. 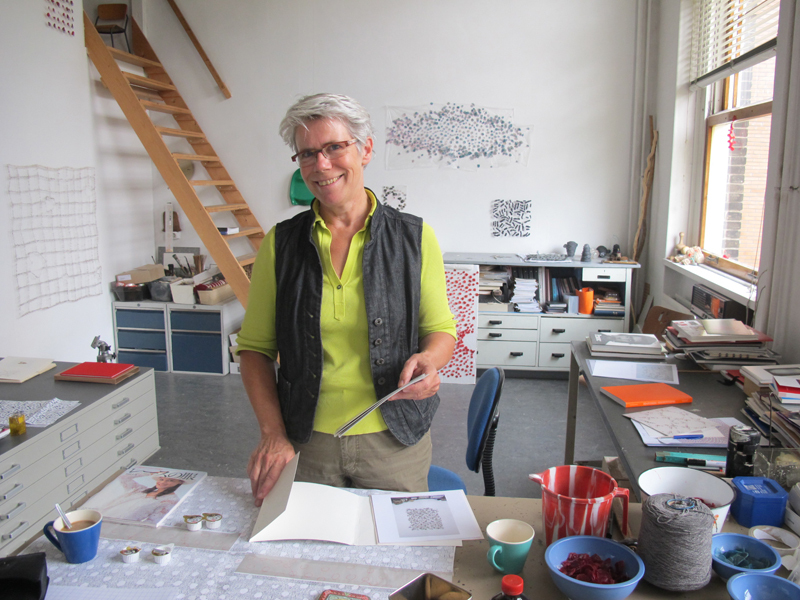 The Studio of Marian Bijlenga at a former Amsterdam hospital, now transformed into artists studios! 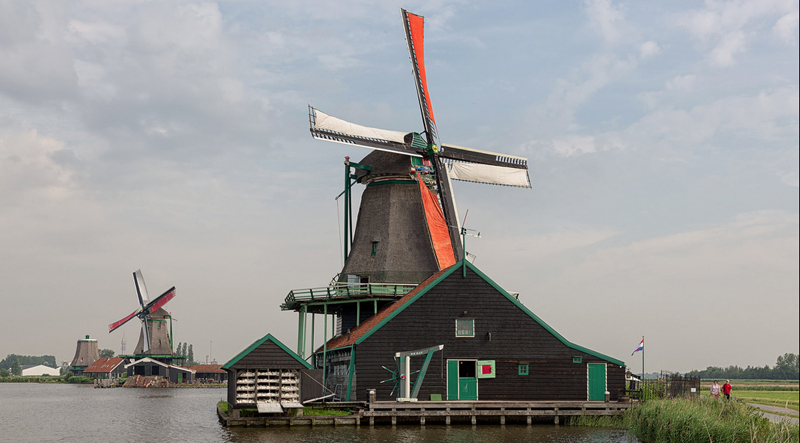 We will visit hers and other studios on the 14th of May during our Amsterdam Day Trip. 7. 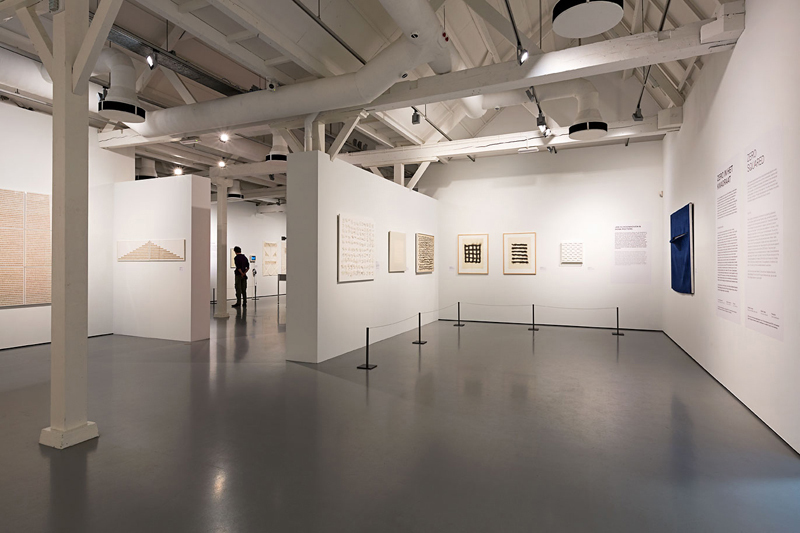 At the Tilburg “TextielMuseum” visited on the 13th of May, we will not only see the famous TextielLab but also the exhibition “Zeo Squared” about minimalism in textile art, a recognition for the achievements textile artists have contributed to the field of abstract art. 8. 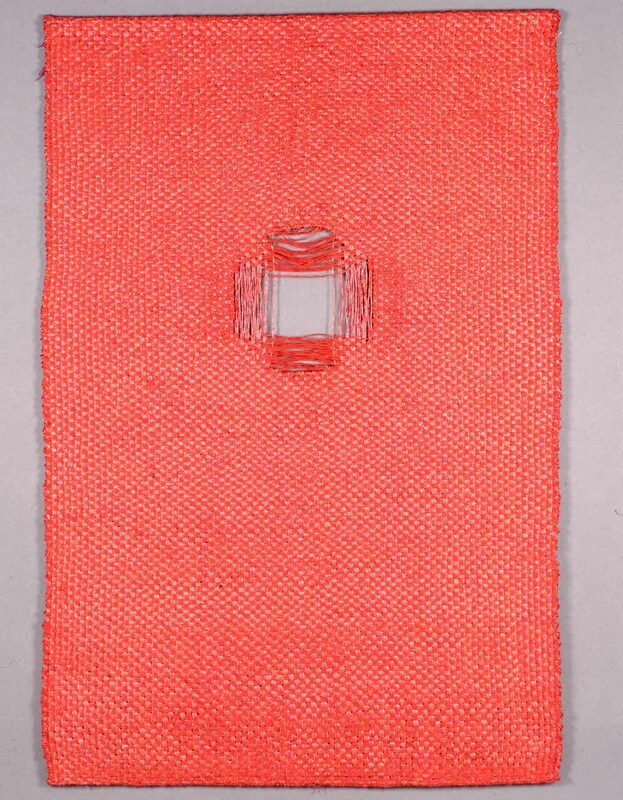 Loes van der Horst “Red Hanging with Hole (rood kleed met gat)” from 1972-73 at the Zero Squared exhibition in Tilburg, as an example of this minimalism. 9. 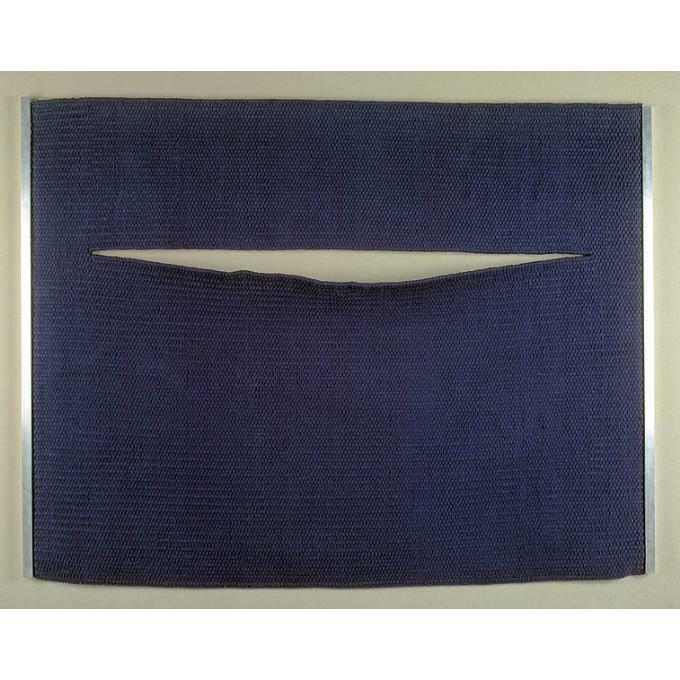 Wil Fruytier “Hanging with Slits (spletenkleed)” from 1995-96 also to be seen at Zeo Squared exhibition, a further example. 10. 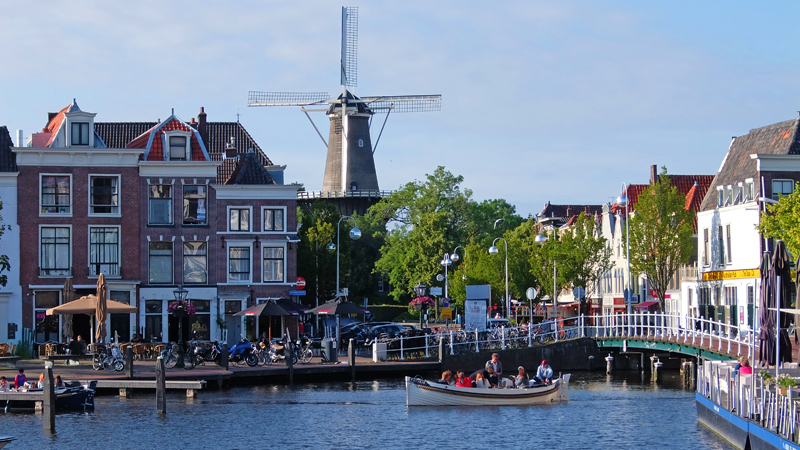 The Rijswijk Textile Biennale will be visited on Friday evening the 15th of May. 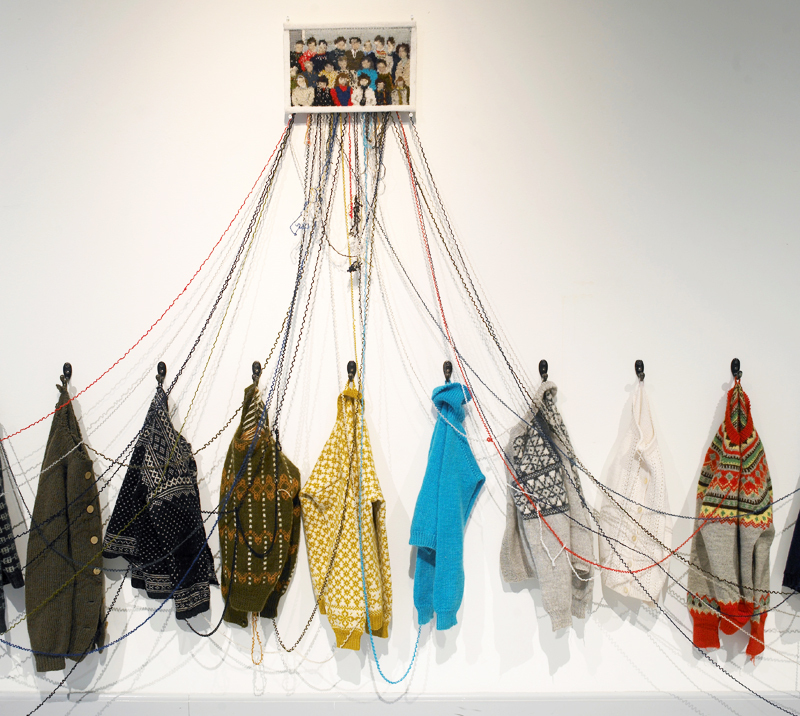 On the photo there is a work by Kari Steilhaug “Fourth Grade” showing a tapestry depicting a group of people wearing sweaters; the sweaters themselves have provided the weaving wool of this tapestry! 11. 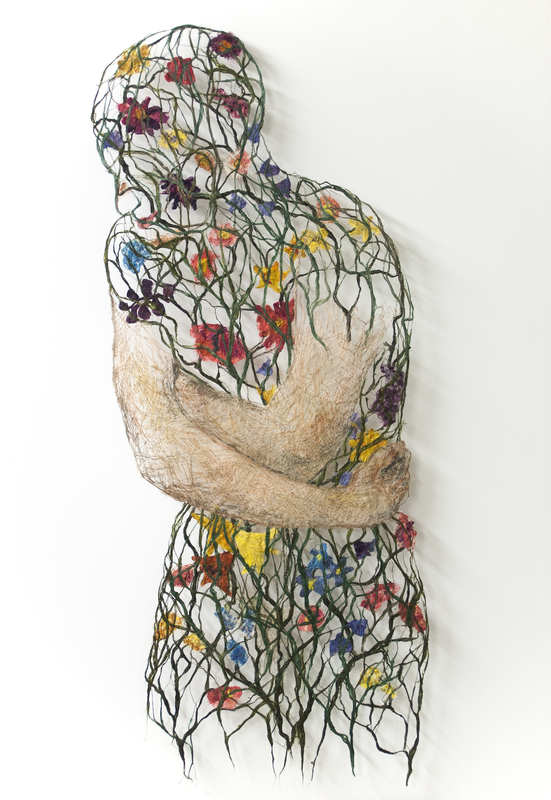 Raija Jokinen “Internal Garden”, a further work at the Rijswijk Textile Biennale. Raija Jokinen is a member of our Network since decades and very active in all kind of international artist cooperations. 12. 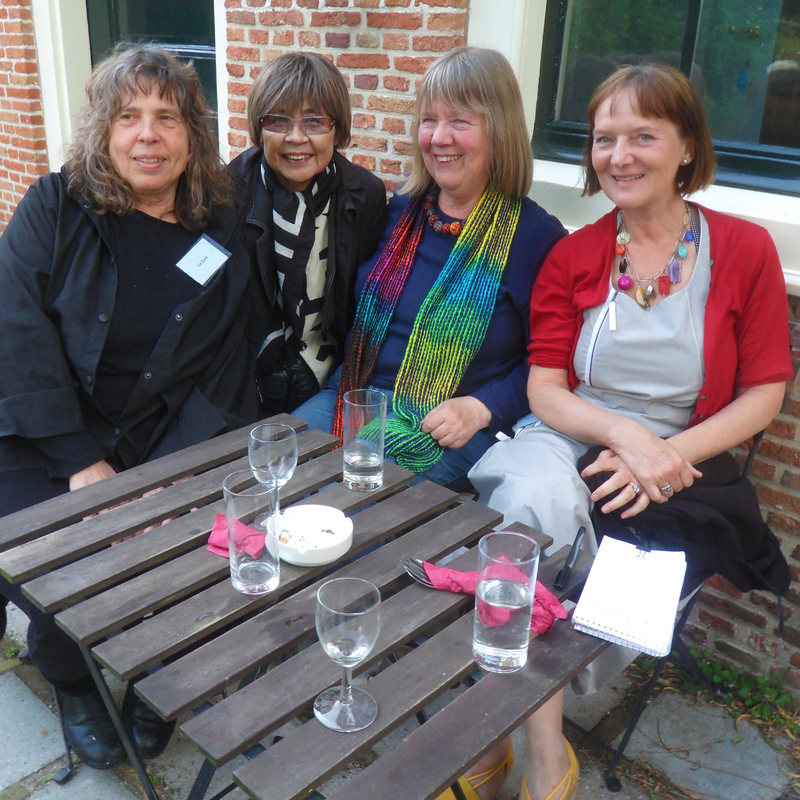 At the garden of the Rijswijk Museum during the opening the last Textile Biennale in 2013; from left Lia Cook, Hiroko Watanabe, Beatrijs Sterk,and Monika Auch. This year we hope for good weather to enjoy the buffet in the garden during our visit. 13. 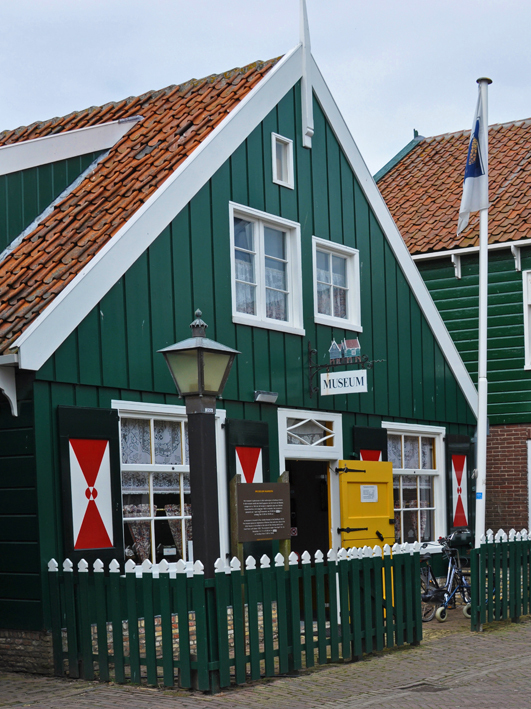 During the Dutch Folklore Tour on Monday the 18th of May: Visit to the traditional site called “Zaanse Schans” with a guided tour of the Dyestuff Mill “De Verfkat”, where we will learn about pigment making, a.o. for textiles. 14. 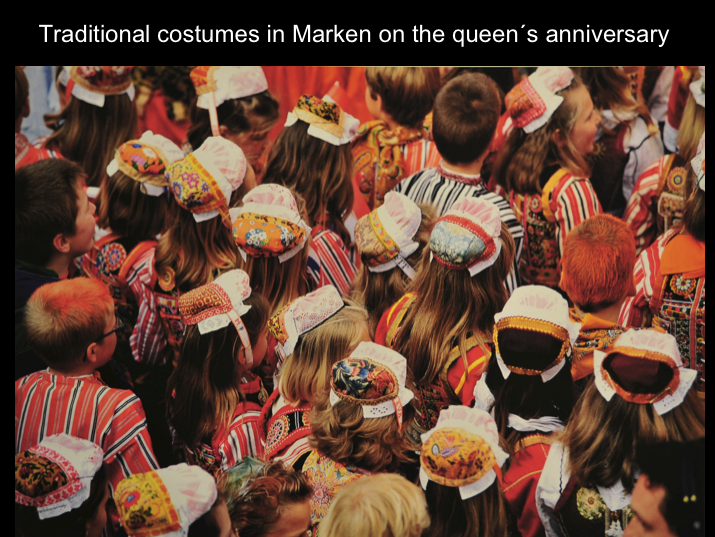 The peninsula of Marken, one of the last places were traditional dress might still be worn, is a further stop on our Dutch Folklore Tour; the photo is showing the Marken Museum where a special exhibition about traditional children costumes will be on show for us. 15. Traditional hairdresses during “Koninginnedag (the Day of the Queen)”, a n annual special festive day at the end of March, when everybody Dutch dresses in orange! 16. 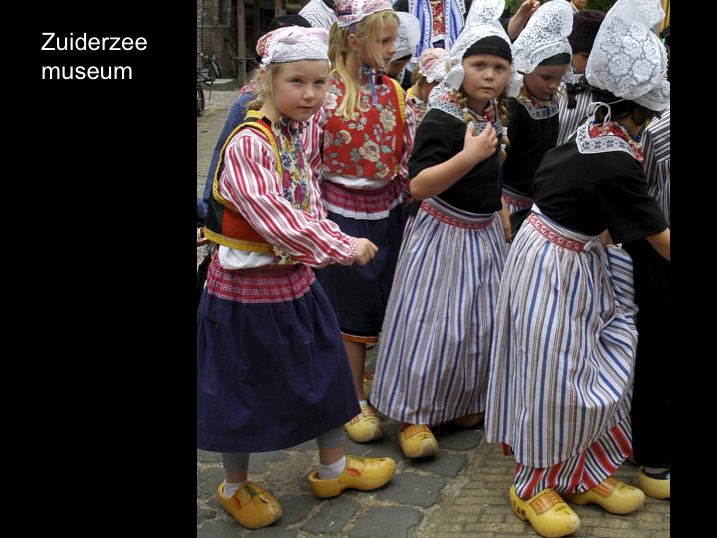 Modern children wearing traditional cotumes at the Zuiderzee Open Air Museum in Enkhuizen. 17. 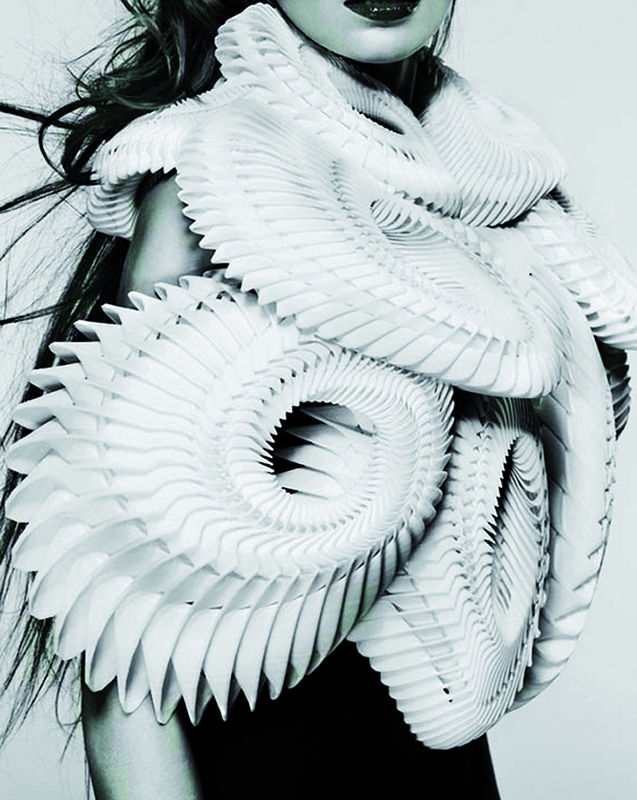 Iris van Herpen “Crystallization”, 2010; one of the very first 3D printed haute couture works. Still not completely flexible. We will visit the Belgium company Materialise in Leuven as the place where fashion designers, artists and architects have their large-scale designs realised in 3D printing. 18. 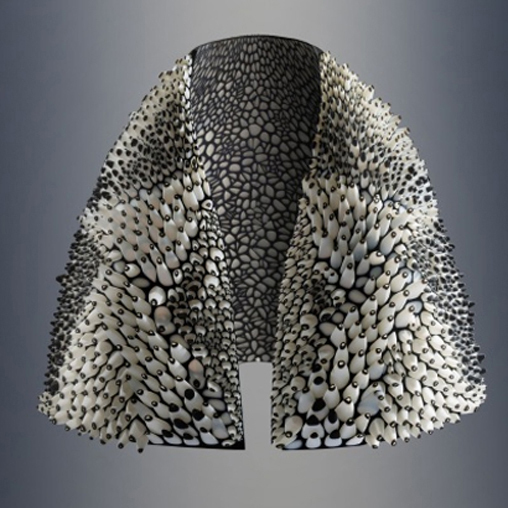 A further work by Iris van Herpen, the “Voltage” collection, made at the company Materialise. 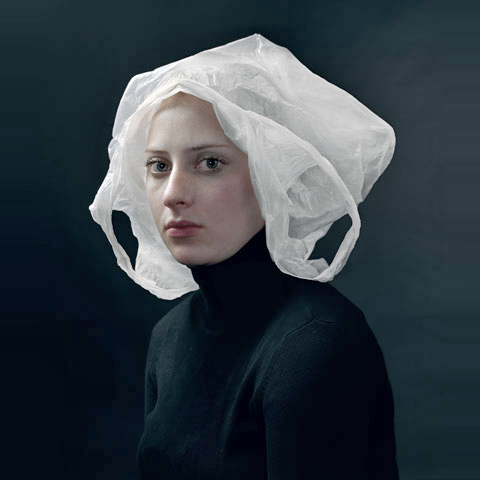 Further Dutch designers having made their work here are Anouk Wipprecht, threeASFOUR, Studio XO and more. 19. 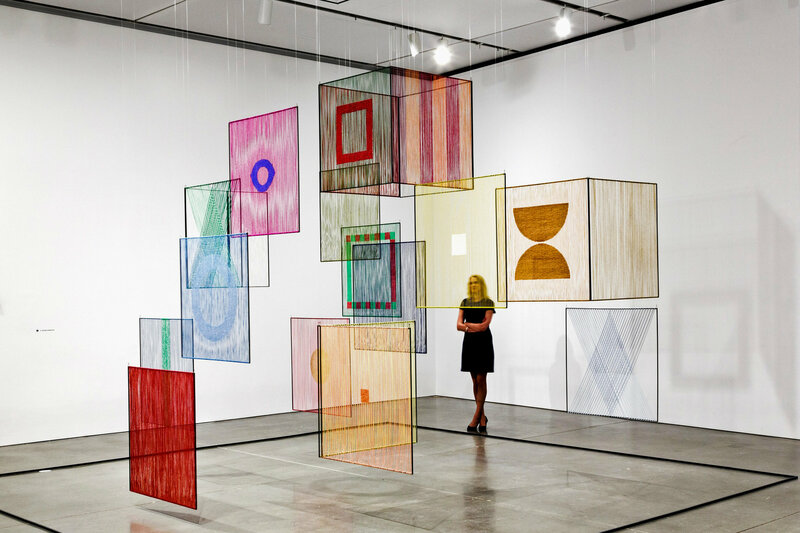 Asked to include something on the importance of Fiber Art I would like to show this image from The Lausanne Biennale: Elsi Giauque “Spatial Elements” 1974, shown in the Boston exhibition Fiber Sculpture, that is now touring the USA. I wanted to show this as an example of a well-done textile art exhibition. 20. 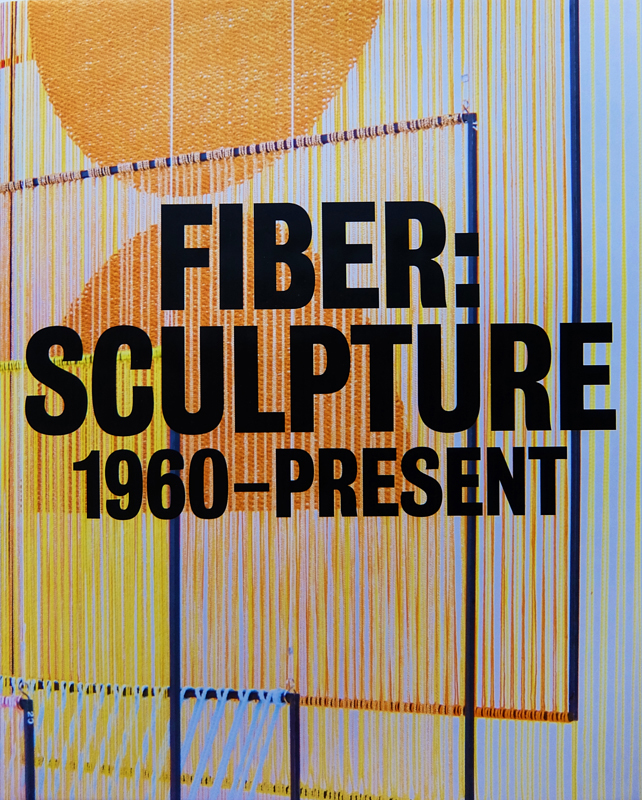 The catalogue of Fiber Sculpture is highly recommended to order, as it shows how exceptionally well this exhibition was researched and written about. 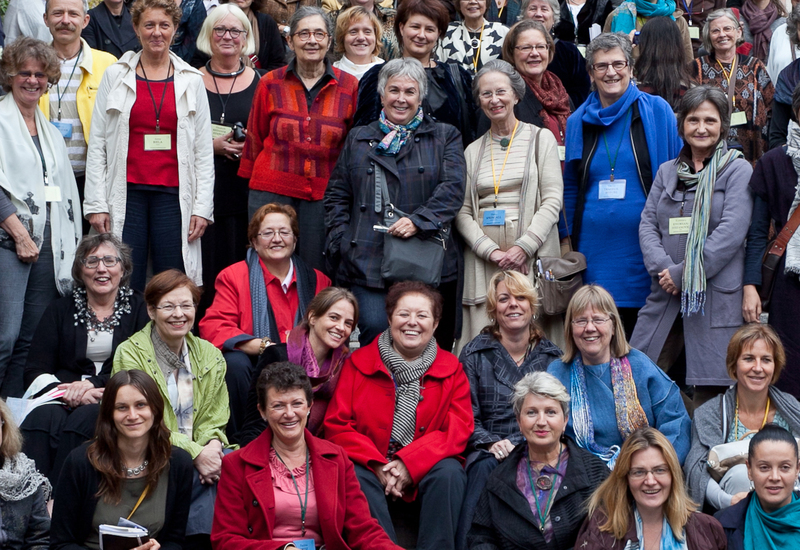 Not about painters doing a poor little bit of lousy fiber, but the real great names of textile artists we all know from Lausanne at the beginning of the 60s and 70s. This kind of textile art history is what we need as a contrast to the random use of textiles in fine art in todays exhibitions. This blog entry is made along the pictures of the small talk I will give at the Nordic Textile Art meeting on the 19th of March in Helsinki!